The very best thing about eating a low-carb/high-fat keto diet is that I can have sweet things pretty much daily and still be a fat-burning machine. 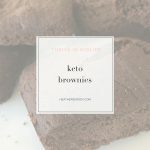 Of course, the best way to enjoy keto sweets is to make them yourself. These keto brownies are made with coconut oil and unsweetened bakers chocolate that you can find in any grocery store along with organic oat fiber which is pure insoluble fiber and is great for keto baking. 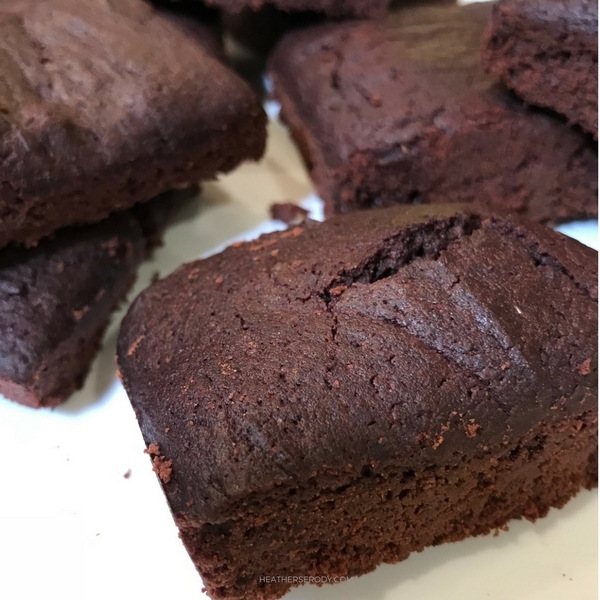 For more on why oat fiber is great for keto baking read this post. Grease a 9" square brownie pan well. In a medium-sized bowl, combine all of the dry ingredients and whisk together well until combined with no lumps. In a large microwave-proof bowl, add the coconut oil & chocolate. Microwave for 45 seconds & stir. Return to microwave for another 30-60 seconds or until chocolate & coconut oil are melted. Remove from microwave & whisk until well combined. Add vanilla extract, stevia glycerate, and half & half and whisk again. Add eggs & whisk until combined. The batter will thicken up. This is okay. Add the dry ingredients to the wet ingredients and stir until completely smooth. Pour into brownie pan & smooth out the batter evenly with the back of a spatula. Bake for about 20 minutes, or until the edges are just turning crisp, the middle is set, and a toothpick inserted into the center comes out clean. Allow brownies to completely cool in the pan before cutting. The carbohydrates in both Swerve & Organic oat fiber are not utilized by the body and are therefore not listed on the nutrition information. For more details go here and here. All the products I recommend from Amazon can be found on my Amazon Products List – click here for convenient one-stop shopping. Thanks for the recipe! I’m going to try this out once the ingredients come in the mail. I just started keto, but I would also like my kids to lower their sugar intake as well. They love those fiber one brownies, so I’m hoping this will be a good replacement!